Not much competes with the nostalgia of an old theater. These historically significant spaces served as the leading location for entertainment back in the day. Thankfully, many historic theaters across South Carolina have been well-preserved, still serving as a reminder of the state’s storied past. Catch a play, concert, and more at these 10 historic theaters in South Carolina. Touted as one of Charleston’s most haunted locales, the Dock Street Theatre is still fully functional as a playhouse. Dock Street Theatre was the first building built in America specifically to be used for performing arts, but was burned in Charleston’s Great Fire of 1740. The love for the stage and a passion for the arts ensured the theatre was rebuilt and given plenty of life to keep it thriving. 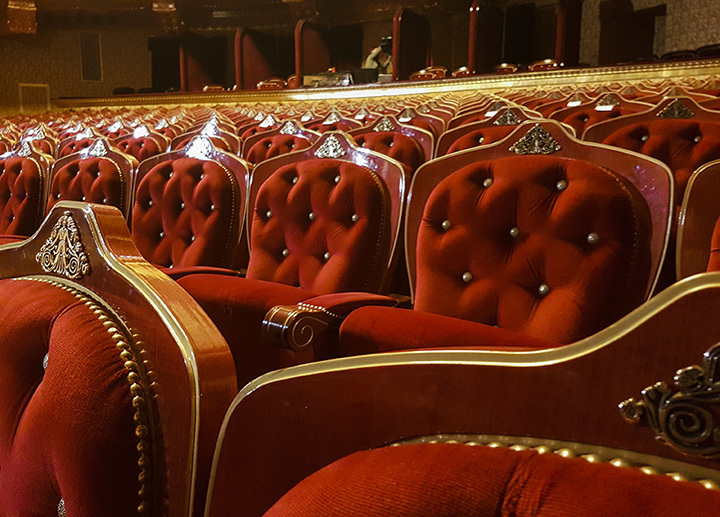 Just as magnificent today as it was a century ago, the Abbeville Opera House has seen the likes of everything from vaudeville to Broadway shows and everything in between. The town of Abbeville has a long history in the theater industry, having served as a stopover for touring shows and still playing home to a variety of performances each year. The Sylvia Theater remains an active icon in York history with regular movie screenings, musicals, concerts, and other performances throughout the year. The theater also serves as a rental space for parties, weddings, and other events. Home to the Lowry Family Theater, the McCelvey Center was once home to the Yorkville Female Academy in 1852. It now serves as home to the Historical Center of York County. The Lowry Family Theater continues to host musical events, including the annual Southern Sound Series. My office had been relocated to the McCelvey Center in historic York, SC. My work email is still the same - send me a message if you need my new office phone number. Dating back nearly 100 years, the Town Theatre was established to encourage vocal and artistic development in the community. This family-run theatre became a place for families to not just enjoy plays, but also experience and participate in them. Today, the theatre has undergone extensive renovation and continues its mission to bring the stage to life in Columbia’s culture. Housed in what used to be Utica School, Oconee Community Theatre was finally granted space in the building in 1989 after having used a furniture store, an old movie house, and school auditoriums to fulfill its stage needs. Utica School opened in 1927 as a school and operated as such until its closure in 1989, at which point the non-profit theatre group took over its space. Each year brings a new ensemble of shows to delight the community while paying homage to a bit of Seneca history in its cultural digs. Having opened its doors in 1942 as a movie house, the American Theater was named to honor the men and women serving in the military. Today, movie showings are few and far between, as the space is now primarily used for private events, parties, and weddings. The classic marquee is still largely in use and is an important piece of Charleston history. Not to be confused with the popular kid’s TV station, the Nickelodeon pays homage to vintage theater with its eye-catching marquee and show lighting. Founded in 1979 by two local college students, the theater was formed to serve and inspire film critics and artists who loved the silver screen. Today, the theater has moved from its converted bank location to the former Fox Theater. Its screenings include a mixture of indies, special screenings, and one-off viewings throughout the year. The Capri opened its doors in 1936 as a movie house for 72 years. Since 2008, the theatre has transformed into a space for the performing arts that features improv shows and live music. It now also serves the Gaffney community as an event venue and meeting space, though its historic sign remains untouched. On the back streets of downtown Columbia lies the historic African-American theater that catered to the area’s community of doctors, lawyers, ministers, and trade professionals, as well as nearby African-American colleges. The building was popular for showcasing movies and talent shows, and has since been designated an historical landmark. View more South Carolina Theaters and Playhouses.